As I have written before, I take just about every photo using the Camera RAW setting. I’ve been doing this for some time and have gotten used to the very large files and extra steps it takes to process them, in contrast to taking JPEGs. However, the added flexibility and quality of the final result is worth it. Recently, I’ve added an extra step to my workflow. When using the Adobe Camera RAW editor, you can chose to process the image using either 8 Bits/Channel or 16 Bits/Channel. Generally, I have been using 8-Bits/Channel, especially if I was working on an image that I was going to finish up in PSE 10’s Editor, rather than Photoshop CS6. Elements can open a 16-bit image, but can’t do many things with it. For example, Layers are not supported. So here is how to do it. While you are still in the ACR, you select 16 Bits/Channel as shown in the above figure. The adjustments you make are then done before the file is opened in the Editor. Once the file is opened in the Editor, you convert it back to 8 bits/channel via Image > Mode > 8 Bits/Channel. Doing this conversion, allows you to take advantage of the higher bit setting to do the math in ACR, but ends up with a file that PSE can work with. In theory this should lead to less color banding, for example in skies, and in general allow you to adjust the sliders more aggressively in the ACR without the picture breaking down. 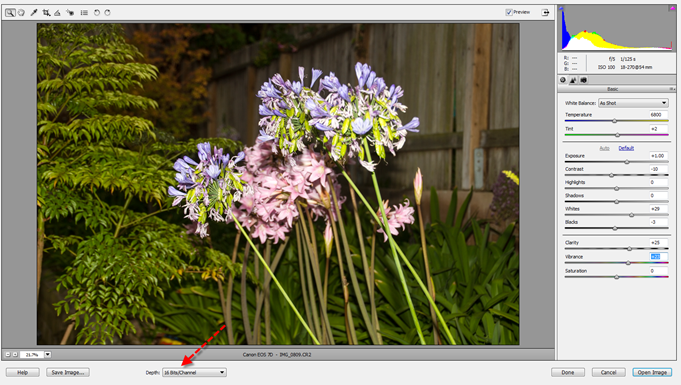 This is especially important if you are using the ACR to simulate a high dynamic range (HDR) image. Give it a try and let me know if you do/don’t see any differences in the quality of your edited camera RAW images by leaving a comment below. Also, if you found this post helpful, please give it a high rating. Thanks for reading.